Andrew Scala, sensei at Darien Martial Arts Academy. 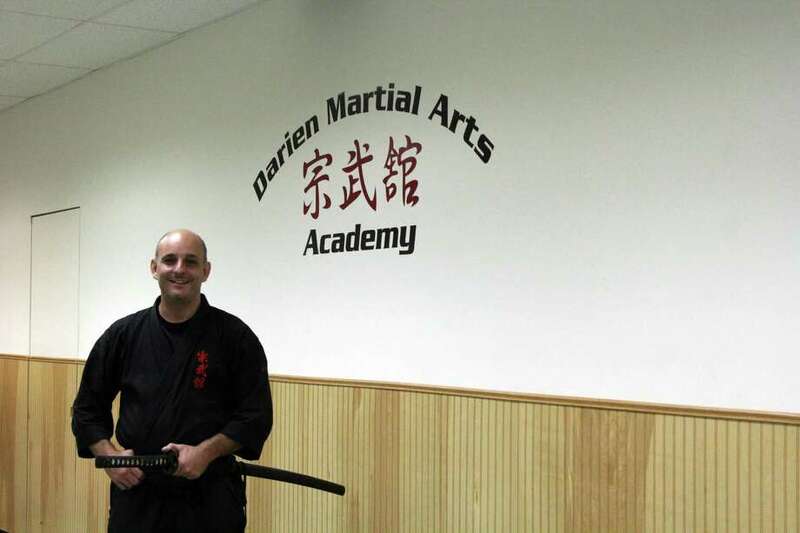 DARIEN — Being introduced to martial arts was transformative for Andrew Scala, sensei at Darien Martial Arts Academy. Scala, a 51-year-old Easton resident, said he has 25 black belts in five different styles — iaido, bojiutsu, jojiutsu, aikido and karate. The Darien Martial Arts Academy at 346 Heights Road was established in 2007. The location offers karate classes for children through high schoolers, as well as personal training classes. Growing up in Darien, Scala participated in a lot of sports, but it wasn’t until he was around 10 that he started getting into martial arts. However, it was only while playing lacrosse at New England College in New Hampshire that he became more involved with the sport. After graduating college, he contemplated becoming a businessman, playing lacrosse in Australia, or moving to Japan and studying martial arts. The first choice to be dismissed was playing lacrosse in Australia. While working as a salesman for Perrier in New York, Scala decided he did not want to have regrets and wanted a change. Scala then moved to Hokkaido, Japan, and lived with a friend he knew from Darien who was already there. He also worked as a translator and an English-speaking teacher. He learned aikido, karate, iaido and more at a dojo called Sobukan. In the eight years he would spend in Japan, Scala taught himself how to speak Japanese by reading books. “I’d read kindergarden books and then work my way through the education system,” Scala said. He would also come to learn the language through his interactions with his sensei and at the dojo. “I’d say in two years I was fully competent in full conversations. It was broken, but I was competent,” he said. By his eighth year, Scala was proficient enough to be a translator and interpreter. Scala also adopted the samurai code of bushido — the way of the warrior. “I think it (the code) has always been a part of me and that’s why I was attracted to it,” he said. Scala said studying martial arts in Japan helped him discover what he was born to do. “I had finally found where I belong,” he said. During his seventh year in Japan, Scala received a call from his older sister, and knew something was wrong because it was uncommon for her to call him. Scala said he left immediately to visit his father. While visiting his recovering father in the hospital, Scala promised him within one year he would return to the United States. Martial arts was one of the key aspects in his life that taught him how to handle this type of adversity, Scala said, and now his students are able to learn these types of lessons. With martial arts, students able to learn conflict resolution, Scala said.